Foam. 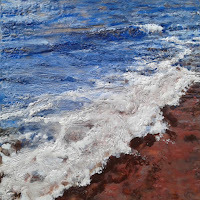 8x8" Encaustic on birch panel. All images copyright Elisabeth Hewlett. Elisabeth Hewlett is a contemporary painter from Montreal, Quebec. She holds a DEC in Illustration and Design from Dawson College (Montreal) and a BFA with honours, majoring in painting and drawing, from Concordia University (Montreal). In the years following her training as an illustrator, Hewlett worked with clients from a wide range of fields including advertising, children's illustration, health & wellness, architecture, product and portrait photography, publishing and television production. Since 2012, Hewlett has gravitated back towards fine art and a deeper form of expression and communication. Her practice includes painting and drawing in both realist and abstract genres, working in a variety of media, predominantly acrylic paint, graphite, charcoal, oil paint and encaustic. Her work has been featured in various places, most recently as part of a juried group collection of contemporary works at Stewart Hall Art Gallery in Pointe Claire, Quebec. Her paintings can be found in private collections in Ontario and Quebec.